1. Please kindly note that solar charging is for emergency use, not take solar power as primary charging source. 2. We highly recommend you fully charge the battery via wall charger upon first use. 1. Built with high conversion efficiency solar panel, make full use of the natural solar power. Where there is light, there is power. 2. 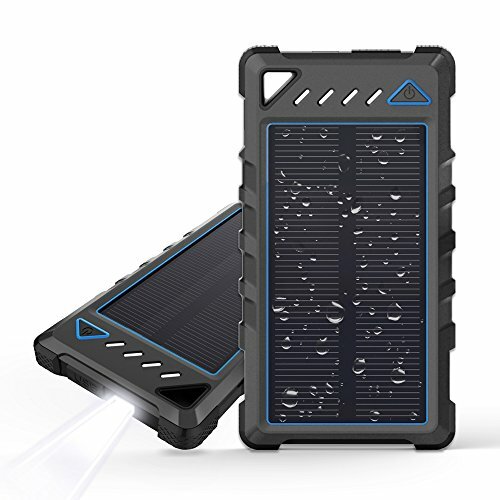 Prominent outdoor style: Reinforced process on the four corners makes Beartwo solar charger more sturdy under shock; Rugged process makes it skid resistant, perfect for various outdoor activities. 3. Portable design: Compact size(5.51 x 2.95 x 0.7in), built with 10000mAh large capacity battery, no worry about running out of battery. 4. Double Press in seconds to activate the LED flashlight, short press to switch different modes, long press to shut off the flashlight. 1. Automatically detects charging device and delivers optimal current, provides faster charging experience. 2. Built in intelligent security protection to avoid over-current, over-voltage, over-load and short circuit, ensure stable power output, reliable choice for charging. 3. Compatible with iPhone, Samsung, Android phones, wiondows phones, GoPro camera, GPS, tablets and most USB charging devices. 1. Every Beartwo product includes a 60 days money-back and 24-month worry-free Guarantee! 2. Please kindly contact us once you get trouble with our product! 【Compact & Portable Design】- One of the smallest and lightest solar charger on the market(only weighs7.4oz). Extra hanger included, easy to hang on your backpack, perfect for camping, hiking and various outdoor activities. 【Dual-USB Output】- Charge 2 devices simultaneously with max output up to 5V/2.1A, deliver fast charge. Only takes 4-5 hours to fully charge the battery(via 5V/2A charger), save your charging time than most other similar power banks. 【IP67 Waterproof】- Every USB port or micro USB port is covered by rubber cap, better protect battery from water; Reinforced corner makes it more tough and sturdy; Rugged surface to avoid slipping. 【Built in mini LED Flashlight】- with three modes available(Normal /SOS /Strobe), convenient to control with one button. SOS mode is specially designed for emergency use. 【Safety for Use】- Made of eco-friendly silicone rubber and ABS + PC material. CE, FCC, RoHS certified, reliable and durable. Kindly noted that it's comparatively slow to recharge the battery via solar power due to limited solar panel, please do not take solar as main power source. Please kindly contact us anytime when you meet trouble with our product ! If you have any questions about this product by BEARTWO, contact us by completing and submitting the form below. If you are looking for a specif part number, please include it with your message.